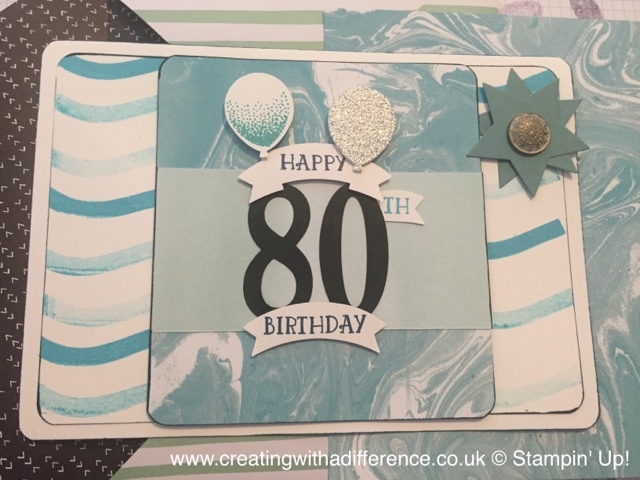 It was my Grandad's 80th birthday this past weekend and here are the cards I made for him. I made one from us and one from my Mummy. They are A5 size which is my largest size. I do those and 4X6 inch which are my smallest. I do make some in between sizes and larger cards on request but I stick to a rough guide as I find customers like to be able to see which size and then choose. My large cards sell for £5 as I make a unique envelope with it and my small are £3 as I use Stampin' Up! pre-made envelopes. What do you do with your extra cards? Message me or comment! These cards are both using an A4 sheet of card scored in half. The first card is using dapper denim and the second is whisper white. As you can see I went for a blue theme as Grandad supports Rangers FC which has blue as their main colour. I had some balloons already made when I was doing some party invites for a friend. They were using the same colours so I thought I would add those too. The DSP used on them has retired but there are so many amazing new ones you won't miss out. I stamped the 80 straight onto card for the first card whereas I die cut them and stuck them on the second card. 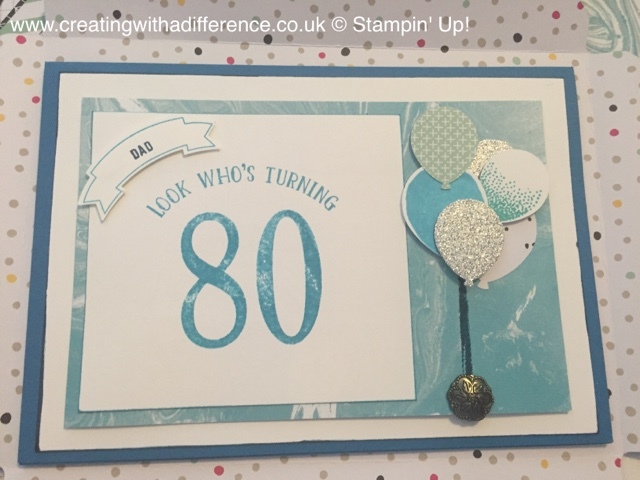 The card used for the second 80 is originally tangerine tango but that didn't match so I dipped them in dapper denim and they now look black which goes with the colour scheme much better. I often do that what using items/embellishments made from other projects as it saves waste and means I am making the most of my money. As all crafters we want everything we see but sadly that's not actually achievable so being frugal means we can make the most of our money and supplies. I used the new duet banner punch on both cards and used the sentiment from number of years. I also used the bar stamp from thoughtful banners stamp set to make my own DSP on the second card and used the Dad sentiment and banner outline on the first card. I used some antique brads and retired DSP on the first card. I then used the envelope punch board and followed the instructions to make the correct sized envelope. I will be doing a video on YouTube next week demonstrating how to use it so stay tuned! Find me as Creating With A Difference. Grandad LOVED his cards as always and they were the best (in my humble opinion hehe) out of all of the cards he received.